When the first BMW X5 M went on sale in 2009, it was in many ways a revolutionary model: No previous vehicle from BMW M came with all-wheel drive on board, it was the first BMW M with turbocharged engine – and of course it was the heaviest M car every built – well over 2,000 kg. Five years later, we have long been accustomed to many aspects of the powerful M SUVs, and the landscape has also changed a bit for the M Division – we now have turbocharged engines for M3/M4 and M5/M6, and the future generation sedan and high-end coupe will most likely get an optional all-wheel drive. Therefore, the introduction of the new BMW X5 M and BMW X6 M has been received with less criticism than before. The engine has also been revised and now the S63 4.4 liter V8 biturbo delivers 575 horsepower and 750 Nm of torque (553 lb-ft). Thanks to the new eight-speed automatic transmission with M-specific set-up, the motor is more often in an ideal speed window and should act as an even more supreme in everyday life. When full power is not required, fuel consumption is reduced by more than 20 percent. The official fuel consumption of 11.1 liters per 100 kilometers still doesn’t make the X5 M the most efficient car out there, but nonetheless impressive for an SUV of that size and power. Standard spring was also significantly improved, from 4.7 seconds to 4.2 for the new generation. 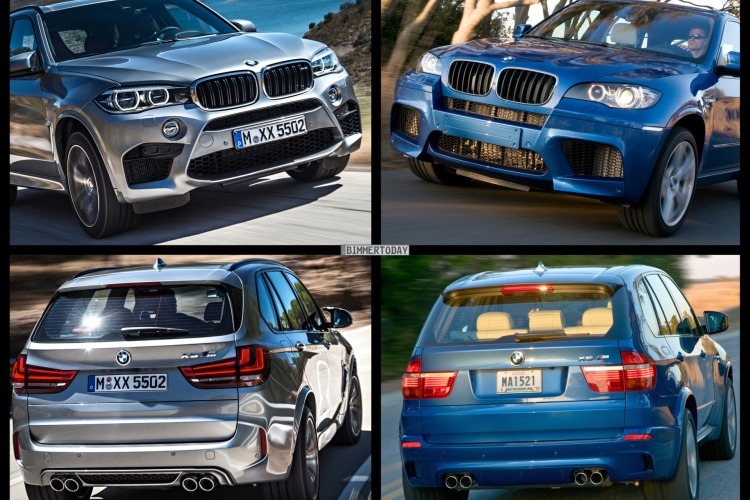 The size of the new F85 BMW X5 M has been increased. Compared to its predecessor, the F85 X5 M measures 192.1 versus 190.98 in, while the wheelbase is barely longer: 115.5 in vs. 115.47 in. The width is smaller though: 78.1 inn vs 78.5 in, and its height has been reduced as well – 67.6 in vs 69.45 in – giving the car a sportier stance and increasing dynamics on the road and track. As always, we put together a photo comparison to see how the two cars look from the same angle. Interesting enough is the fact that the E70 X5 M still looks quite fresh. Jeep Grand Cherokee Trackhawk Hellcat: Does it threathen the X5 M? The new X5 M looks more sophisticated, and refined then the previous generation, especially the interior. But I think the new X5, and X6 in general are far more refined looking then the last.